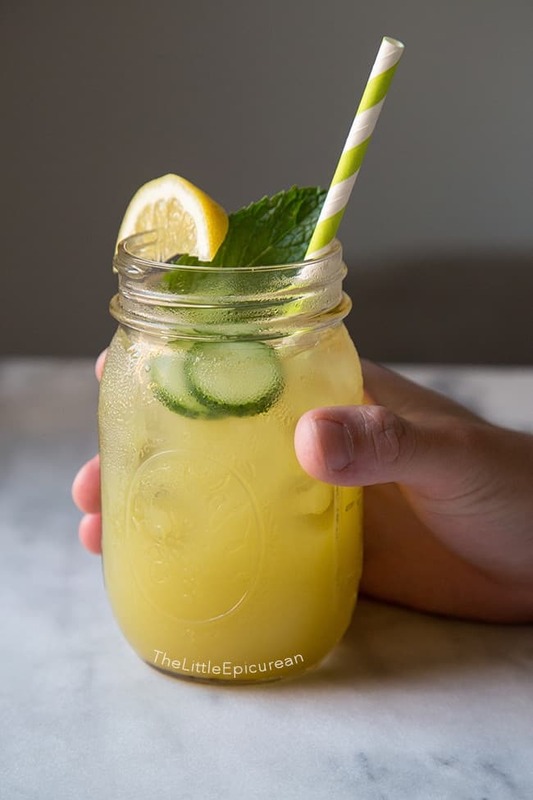 Cucumber mint lemonade takes three super hydrating ingredients and combines them for the ultimate summertime refresher. Cucumber water is the quintessential spa beverage. I would know because I am a spa addict. Ever since my mom first took me to get a facial when I was around 16, I’ve been hooked. Relaxing and being pampered is my favorite way to spend the day. While most ladies look forward to a bachelorette party filled with bottle service, nightclubs, and excitement, I’m pretty sure mine is going to be a weekend at some swanky spa. 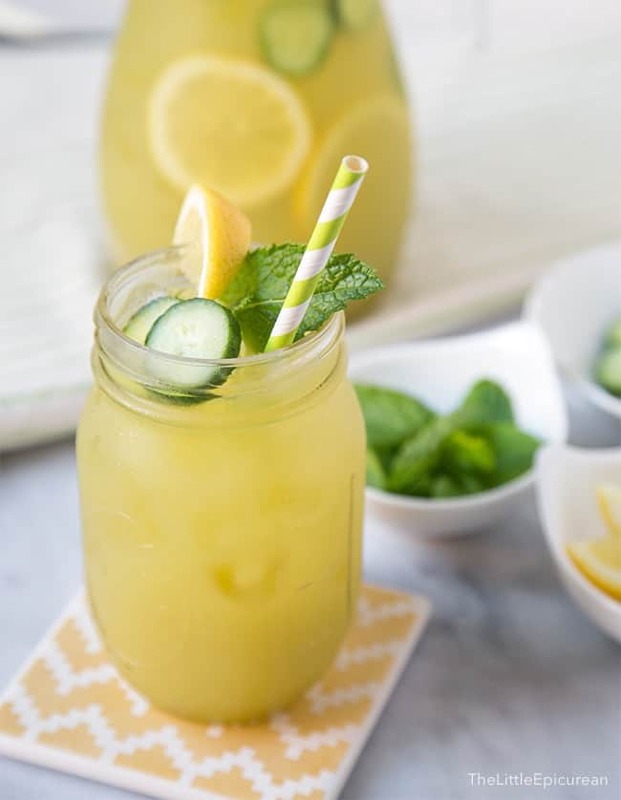 With hot weather and sunny days ahead, it’s time to come up with all sorts of lemonades, iced teas, and fruity beverages to take to the beach or enjoy poolside. This one has become my favorite! 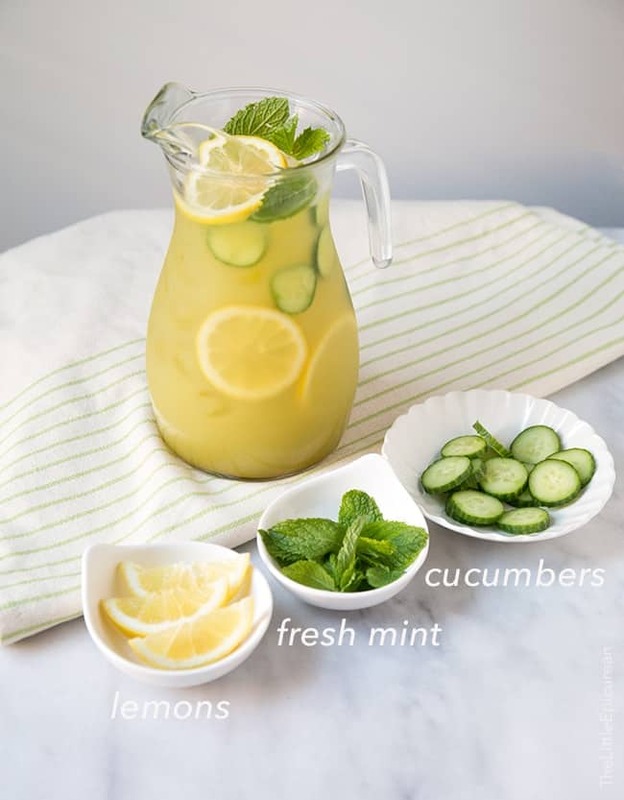 Cucumber mint lemonade takes three super hydrating ingredients and combines them for the ultimate summertime refresher. Charlie is finding new and funny ways to get my attention these days. I’ve been super busy trying to catch up on a million different tasks, prepping for summer vacation with my family, testing a bunch of new recipes, and working on some new projects- that sometimes I forget it’s time to take Charlie on our afternoon walk. I’m not sure if Charlie can tell time or what, but at 4 pm every afternoon he’ll find a way to remind me. This particular afternoon had the most perfect lighting and I was lost snapping away taking more pictures than I needed. Finally Charlie had had enough and decided to photobomb my photo session. I laughed, stopped what I was doing, and took him for a long walk. So back to this drink; I love cucumber water and I drink it regularly. I find it so fresh and cooling. 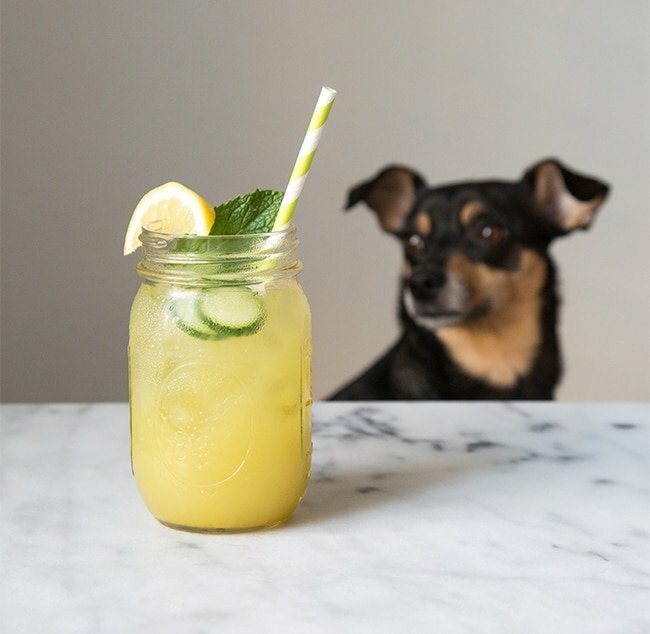 But by adding some mint and lemon, it becomes an even fancier drink. In a small sauce pot, combine sugar and 1/2 cup water. Bring to a boil until sugar dissolves. Remove from heat and let cool slightly. 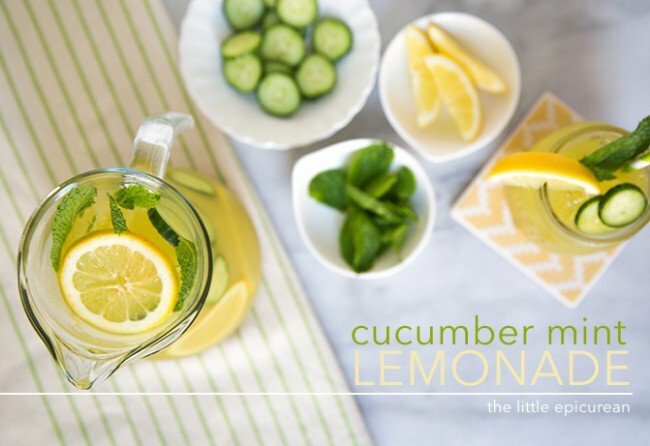 In a blender, combine cucumbers, mint leaves, lemon juice, and slightly cooled simple syrup. Puree until smooth. Strain through a fine strainer (or cheesecloth). Pour lemonade into a pitcher. Add remaining 2 cups of water. Stir to combine. Keep chilled until ready to serve. I think your pictures should include more of Charlie…by the way your drink looks yummy! I could drink this every single day – wishing a had a glass to relax after the whirlwind couple of days we had! And PS. Your bachelorette party idea sounds just like mine (adding a fancy restaurant to cap it off, of course:). Thanks! The cucumber juice doesn’t provide a lot of taste, but it does make the drink super refreshing :) I hope you like it! This lemonade was absolutely amazing! Not too sweet and so refreshing. Steadily using up my cucumber laden-garden with this! Hi Mia! I suggest using a floral gin like Hendrick’s. It pairs really well with cucumber drinks. Did you peel the skin off the cucumbers?